Economics is a very wide regimen. MA Economics at St.Teresa’s College started in 1995. All the students of the department are introduced to economic institutions in the rapidly changing global environment. 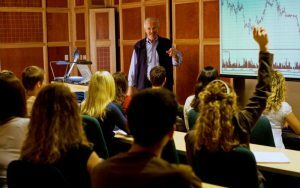 Theory in economics enables one to think critically about a range of complex issues. This PG programme opens a thoroughfare for students those who have an inclination towards a career in the corporate sector. We are among the Economics departments who teach papers like microeconomics. MA Economics Admission 2018 Started. Diversity is our strength as our department remains committed to the College’s goal in imparting education that gives out citizens who are sensitive with a good sense of social responsibility and deep-rooted humanism. Studios and academically oriented students can pursue Ph.D. programmes, Civil service is a still popular option for those who are interested in administration and framing economic policies. There are 4 semesters. Semester I and II have 10 compulsory papers. Semester III has 3 compulsory papers with two optionals Semester IV has 2 compulsory papers and (3 optionals).